Let’s activate and help this pod make it to the open ocean. (877) 722-5346 Fisheries & Ocean Canada hot line for cetaceans alerts. Thanks for your interest. Unfortunately, we won’t be able to respond to this incident. It is over 2,000 Km away from where we are based and only available by plane. I have been in contact with groups closer to the incident and have been informed that the Department of Fisheries and Oceans will be responding to this incident and determining what can be done to free these animals. Kasco Marine Inc have turned out to be the cavalry. ” Kasco has donated the equipment and help. Getting the equipment to the actual location site is proving tricky. Folks on the ground are in touch with people who are and can help” say Champions For Cetaceans. Kasco is overwhelmed with the outpouring of offers and assistance. We are doing our best to provide all of the assistance we can in the rescue effort by continuing to look for transportation to the remote area of Inukjuak where there is very limited airplane accessibility. With the help and cooperative efforts of the many volunteers and individual and business donations we hope to save these great whales. Please contact Kasco at KascoMarineBigMiracle@gmail.com with inquiries or any information you may have to help the cause. “Many of you will have heard about the desperate situation faced by a group of orcas trapped in ice in Hudson Bay, Canada. They are in a tiny hole in ice about 35km from the small community of Inukjuak. The community has mobilised to help the orcas, but urgently need major outside help in the form of an icebreaker that can cut a path to the open ocean and freedom, along with equipment and supplies that will enable them to keep the hole open until the icebreaker arrives. The nearest icebreaker is perhaps a week away, and it will be costly to send it. Canada’s Department of Fisheries and Oceans is investigating the situation, but investigation takes time and there is very little time left for these whales. The orcas’ only chance is for the government of Canada to make a decision to rescue them NOW and immediately dispatch an icebreaker to the scene. Please rescue the Hudson Bay orcas. Send icebreaker, keep the hole open. Thank you. 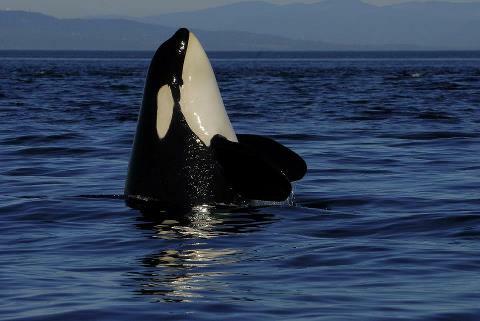 Please assist the rescue of the Hudson Bay orcas…. They will be setting up an account in the morning and Petah Inukpuk, Mayor of Inukjuak will be calling back with the information on where to donate. They need assistance financially. This is a town of 1800 people, the trapped orcas are some 38KM from the town. They are planning on going out tomorrow to begin chainsawing ice away and making the hole bigger. It was about 30 x 30 feet and now it is quite smaller. They feel that they need to keep the hole open until help does arrive. So, they need gas, generators, and chainsaws…. and I am sure warmth, food and water. I will make a page tomorrow to launch a campaign. Update from Inukjuak, 20 mins ago. To the people of Inukjuak and abroud, a meeting was held last night to discuss the killer whale situation. The room was full of concerned men and women. 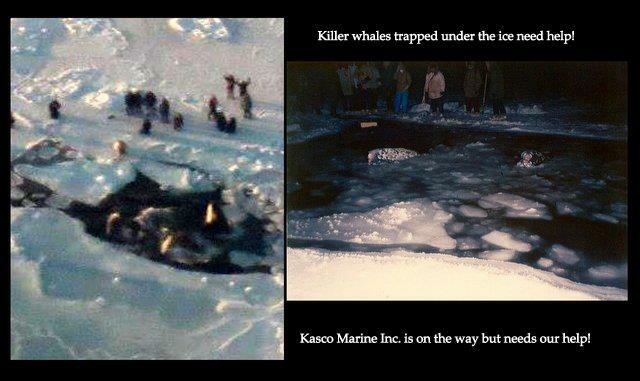 Here is what is happening if the whales are still trapped. A ) About 20 men will go to the site to try to keep the breathing hole open and to open up some more holes. Only these men will be allowed near the breathing hole for safety reasons. Rangers will be there to make sure no onlookers enter the work area. B ) Operation headquarters will be at the municipal conference room and there will be a foreman at the site. C ) For safety reasons, The community members are encouraged to stay away from the site. With virtually no equipment and no resources to deal with this kind of situation, that is all we can do for the moment. Keeping the whales breathing until help arrives. CNN reported that the Orcas have moved on as the ice shifted overnight. They are no longer in the area. There have been no aerial sightings of them since, locally or out at sea. It is hoped that they moved on safely but still no confirmation. If there are any conclusive sightings or updates, I will post here again. This entry was posted in Animal Work and tagged Orcas in Ice Hudson. Bookmark the permalink.